Big River's Grand Excursion Preview - Guttenberg, Iowa, to Prairie du Chien, Wis.
Guttenberg (with a short u, as in gut), Iowa, is named after the inventor of moveable type, Johanes Gutenberg. 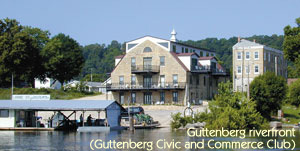 When the original Grand Excursion paddled by in 1854, immigrants had already established Guttenberg as a nearly 100-percent German community. The town boasts wonderful stone architecture, and Lock and Dam 10, with its Lockmasters House Museum. Upriver, the small, quiet river hamlets of Glen Haven, Bagley and Wyalusing, Wis., get even quieter in the winter. Across the river in Iowa, tiny Claytons size belies the fact that it was once important enough to have the county named after it. One of the tallest bluffs on the Mississippi is Pikes Peak, named after Zebulon Pike, who explored the Upper Mississippi in 1805. At Pikes Peak State Park, near McGregor, Iowa, you can enjoy a great view of the Mississippis confluence with the Wisconsin River. Or from across the river at Wyalusing State Park, in Wisconsin, you get a great view of Pikes Peak. Just upriver, an enterprising Scotsman named Alexander McGregor once operated a ferry from the Iowa shore to Prairie du Chien, across the river. The town named after him thrived when the railroad arrived, carried across the river on a swinging bridge of floating pontoons. A mile north of McGregor, a smaller village grew into the largest rail terminus in Iowa in the 1920s. Originally called North McGregor, in 1860 it was renamed Marquette, after one of the early European explorers of the river. The rail yards were abandoned after a severe flood in the late 1920s. Today Marquette and McGregor plan to grow their tourist economy by developing a resort-conference center with an indoor water park, ski hill and golf course. A couple of bluffs upriver from Marquette, the Effigy Mounds National Monument contains 195 Indian mounds, 31 of which are effigies  shaped like animals. Visitors can learn about the ancient inhabitants at the Monuments museum. 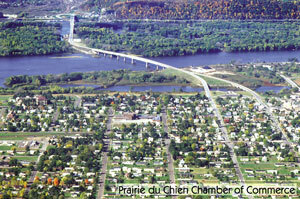 Prairie du Chien, the second oldest town in Wisconsin, was a fur-trading outpost since the 1700s. Fort Shelby was established there in 1814 by General William Clark with a force of 60 men. It was burned a few months later by 650 British troops and allied Indian forces in the only battle of the War of 1812 fought in Wisconsin. Undaunted, the Americans returned to build Fort Crawford. Today the biggest employers in the area is not the military, but 3M and Cabelas sporting goods. St. Feriole Island, the historic heart of the town, was cleared of homes after the flood of 1965. Today, the islands Villa Louis, a mansion built by fur-trading heir H. Louis Dousman in 1870, is operated by the Wisconsin State Historical Society. St. Feriole Island is also the site of concerts and outdoor festivals. This article first appeared in the January-February 2003 issue of Big River magazine, 1-800-303-8201. Copyright 2003, Open River Press, Inc.